Thirty-four years ago in Union Bay, a seven year old boy and his dog failed to return home when his parents expected him. Within a couple hours of the parents’ initial call to the RCMP, the Comox Valley Ground Search and Rescue team was out searching the community and the surrounding forests. They knocked on doors, interviewed friends and neighbors, walked the standard grid patterns, and talked to the media. During the search, neighbors from Union Bay and people from surrounding communities came to help in any way they could. It was the biggest search the group had conducted since they formed. After three days of intense searching the team was incredibly relieved when the boy and his dog were found deep in the forest above his house. He was tired, shaken and hungry, but fortunate to live in a community that included a well-trained and dedicated search and rescue team. In British Columbia, every day of every season, there are scores of people enjoying our vast, wild, and beautiful outdoor areas. All these people experiencing our rugged spaces means there are more chances for mishaps. In fact, British Columbia’s search and rescue volunteers are the busiest in all of Canada. For example, in 2011 there were 1304 searches conducted in our province. The next closest region in search numbers is Nunavut with 163. No other region comes close to the number of searches annually conducted in BC. Here in our neck of the woods, the local search and rescue organization, the Comox Valley Ground Search and Rescue (CVGSAR) has been searching, finding, and rescuing for 40 years. In fact, the CVGSAR, officially founded in 1974, was the first search and rescue group in British Columbia to legally form a society. Mike Fournier was one of the original people who took part in forming the organization and he is still a member of the search and rescue team. The group’s first vehicle was a one-ton van they purchased at cost from a local dealership. “The van was our first mobile command post and it served our needs for quite a while,” says Fournier. With that memory in mind, Fournier is excited about the society’s newest addition. “The new vehicle, the one we’ve just finished, it’s a whole lot more than what we had in the early days.” In fact, the new Incident Command Unit, a custom designed 26-foot trailer, is impressive indeed. It houses computers, communication equipment, mapping systems and a GPS tracking unit to continuously track the location of the search teams. Essentially, the new unit serves as a hub for any large scale operation and allows the CVGSAR to efficiently and effectively move to wherever they need to be, at any time. And that’s a good thing, as the CVGSAR’s area of responsibility covers approximately 2,000 square kilometres of mountainous terrain, lakes and rivers. This large and extremely rugged area, paired with the popularity of outdoor activities, makes the local group one of the busiest in the province. That growing need has been supported by the group of dedicated volunteers who make up the Comox Valley Ground Search and Rescue team. The CVGSAR currently has a team of 60 volunteers, who range in age from 19 to 82. “Our volunteers come from a wide cross section of our community with diverse backgrounds,” Berry says. “Some have very little outdoor experience and some have extensive knowledge of the outdoors. We are made up of postal workers, military personnel, teachers, principals, graphic artists—the list goes on.” Approximately 40 per cent of the search and rescue team, Berry adds, is made up of women. Though volunteers, the people who are the CVGSAR are highly trained in what they do. Initially, each member must take a course to become certified as a ground search and rescue technician. The course, which teaches basic search and rescue techniques and basic survival skills, takes close to 80 hours to complete and runs for three months. After certification, the new members may choose an area of specialization for further training. There are several specializations to choose from, including swift water rescue, rope rescue, avalanche support, tracking, canine teams, first aid/medical rescue, and light urban search and rescue. 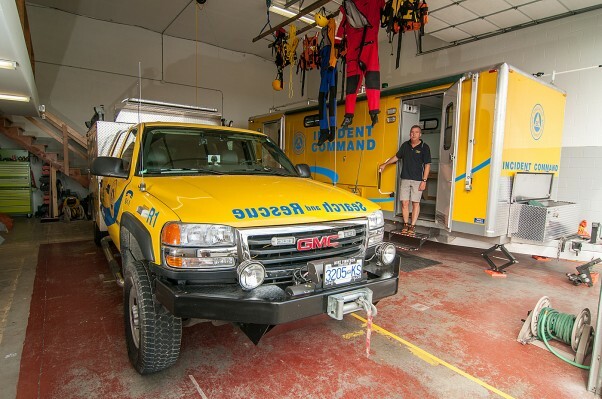 `The light urban search and rescue is a new area of specialization and the Comox Valley Ground Search and Rescue is one of the first in BC to begin training in this area. Though the training demanded from the search and rescue volunteers is intense, there is currently a waiting list of people who would like to become members of the CVGSAR team. “We have a full roster of trained people right now,” says Berry. “We usually need to replace from 15 to 20 team members each year. People leave for various reasons—they move, start a family, etcetera.” Even so, currently there are four people on the CVGSAR team who have been with the group from the very beginning. When someone is reported as missing it’s the RCMP who handles the call first. The RCMP, after filing a missing person report, will then decide if they need to involve SAR. If it is deemed that the SAR need to be utilized, then both the RCMP and SAR will conduct the initial interviews. Though the SAR team will start the search with a solid plan, they must consistently reassess as new evidence comes to light. Rescues can be as short as a couple hours to several days. During a search operation the team members will need to endure up to 17 hour days that are both physically and mentally exhausting. For example, the most recent search for missing local hiker Sylvia Apps lasted for more a week. As well as one of the longest search operations, the search for Sylvia Apps—who is still missing—was also one of the most expensive searches the CVGSAR has ever conducted. The helicopters alone had a daily price tag of approximately $70,000. Thankfully, the provincial government pays for most of the search costs during an active operation. “The government does cover the helicopter costs, meals for the searchers, and some replacement of lost of damaged equipment,” Berry says. Although the CVGSAR is not responsible for the majority of costs incurred during an active search, the group still has an ongoing stack of bills to pay. One regular cost is the price of maintaining and replacing equipment. “All of our equipment has a best before date,” Berry says. “Gear like ropes and harnesses need to be checked and replaced regularly. And the equipment can be quite expensive. For example, a swift water rescue suit and PFD can cost around $2,500.” In addition to equipment, the CVGSAR must cover the costs of rent, utilities and training. As a result, the group’s yearly operating budget is around $100,000. After a search has been called off though, the crew at the SAR will still assist any volunteer or family members who choose to continue searching. Sometimes the family and friends of a lost person will continue the search after the official SAR operation has been called off. When this occurs, the team will assist the continuing search as much as they possibly can. For example, the Apps family is still actively searching for Sylvia Apps, who has been missing from Strathcona Provincial Park since July 11. “We are helping the Apps family with maps, coordinates of past searches, etcetera,” says Berry. The same thing occurred when Jamie Sproule of Cumberland went missing this past May. The SAR team decided to call off the search after three days, but two days later Sproule was found after family and friends utilized maps and search coordinates supplied by the CVGSAR. Though not successful all the time, the CVGSAR volunteers do what they do because they are committed to the cause of wilderness search and rescue. Berry recalls a specific event that illuminates what drives the volunteers. “I remember when our team was called to conduct a rescue operation on Mt. Arrowsmith. The weather at that time was horrible and it took two long and arduous days before the searchers were able to successfully carry the injured man down from the top of the mountain. “I distinctly recall standing at the base camp and seeing the rescue team as they finally came over the rise and into the camp. They were completely wet and covered with filth and mud—but they were also covered with smiles and an evident sense of pride. It amazed me that a group of people could exert so much energy and sustain it for so long—all for someone they didn’t even know,” says Berry.